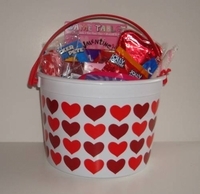 Valentine candy bucket is filled with Valentine candy and two toys. Conversation hearts, sweet tart hearts, wax lips, reeses peanut butter heart, candy bracelet ,hersey kisses, heart shaped suckers are just a few of the Valentine Candy in this bucket. Not only do you get a great selection of candy, but also a two valentine toys. Style and color of bucket varies. Toys included in this bucket may not be suitable from small kids. Style of bucket varies.